SANAA, Dec. 25 -- A family of nine members, including five children, were killed on Monday morning when Saudi-led coalition warplanes hit the family's house five times in Yemen's capital Sanaa, residents and a Xinhua photographer at the scene witnessed. 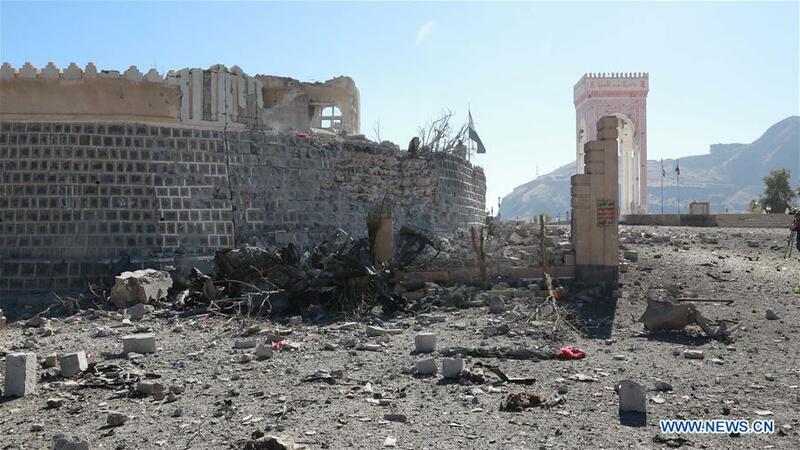 "Father, his wife, two women (who are sisters to the father), and five little children were killed on the spot after their house was hit by five missiles fired from fighter jets of the Saudi-led coalition," Xinhua photographer reported. Rescuers and medics said five other people from nearby houses were critically wounded. Residents said the targeted family's small house is located inside a cemetery near a densely populated neighborhood. Several houses in the area were badly damaged. The residents said the father was working as a guard of the cemetery, which contains graves of Egyptian soldiers who were killed in 1962 when they helped Yemenis in their revolution against Imamate regime. Last week, the Saudi-led coalition airstrikes killed ten women in central Yemen's province of Marib, according to a provincial security official and medics. The women were killed as the bus carrying them while returning home from a wedding party was hit by the air attack. On Dec. 13, the coalition launched seven airstrikes on a prison inside a police camp in Houthis-held capital Sanaa, killing 31 prisoners and wounding 59 others, according to Houthis-controlled state Saba news agency. The Saudi-led coalition has intervened in the Yemeni conflict since March 2015 to roll back the Houthi rebels and support the internationally recognized President Abd-Rabbu Mansour Hadi, who was forced into exile by the Houthis.